This report is a must for the beginning herb farmer. America’s leading expert on herb farming gives clear guidelines on what to think about before beginning a starting a herb farming business. Includes sections on farm farms, crop selection, crop yields, and a sample seven year plan that projects production, revenue and profits. Includes a photo gallery that shows every step of production from seedlings to harvesting and drying, including the equipment needed. 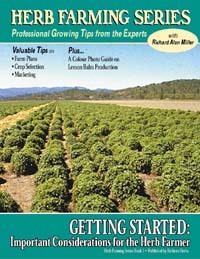 Also has a primer on herb crop contracts: what to watch for when entering into a contract to grow herbs for a buyer. 27 pp.